- Decisions of the working committee held at Ahmedabad. - XITH Conference - to be held on 9th July ,2017 . - Working committee meeting of our Federation was held at KOLKATTA on 17th and 18th January,2016. 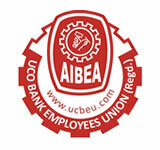 - On Bipartite AIBEA welcomes Government’s advice to Banks to initiate the process of negotiations for next wage revision and conclude it prior to the effective date i.e. 1-11-2017.